I know what you’re thinking. I’m not going to win any prizes for food photography. I tried to prize the Burwash off the paper and poked it a bit to get it to sit up straight. But it wouldn’t, the reason being that it was deliciously ripe and oozy. This was a piece of cheese itching to get on to a biscuit. There’s no worse disappointment cheese-wise than slicing into a Brie or Camembert and seeing that chalky line running through the middle that means you’ve been sold an unripe pup. There was no chance of that with the Burwash Rose. Made by the Traditional Cheese Dairy in Sussex, Burwash Rose is a semi-soft cheese made from raw cow’s milk and washed in rosewater during the first few weeks of maturation. 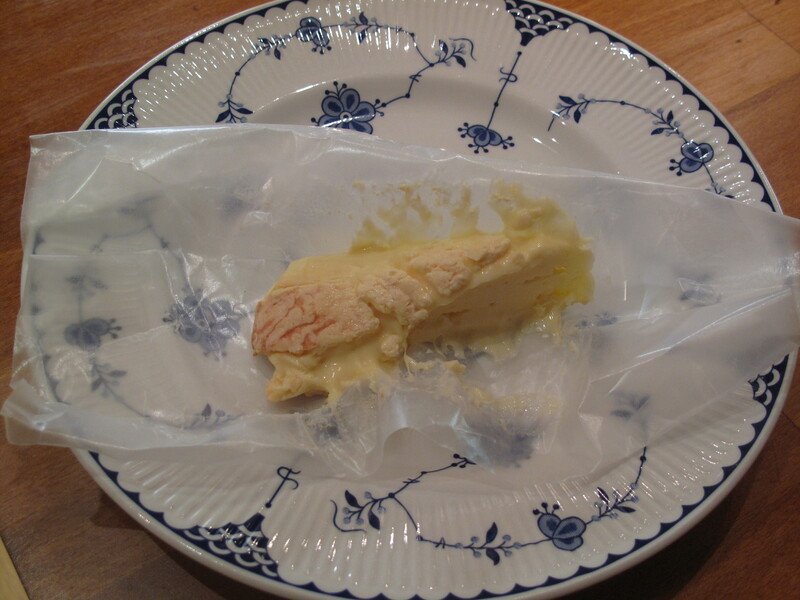 Hence the rind-washing (or smear-ripening, as it’s otherwise known). These were new terms to me but essentially it means that the young cheese is soaked, sprayed or rubbed down with a liquid – this could be anything from brine, beer, brandy or in this case, rosewater. This discourages certain moulds and bacteria but happens to be the destination of choice for one particular bacteria – brevibacterium linens – which thrives in such conditions. It’s this bacteria that gives rind-washed cheeses their sticky, peachy-orange rinds. And because it’s closely related to the bacteria that you find on your feet, it makes them very stinky. I’ve not heard of Burwash Rose, I always find it incredulous how many amazing cheeses there are now in the UK. A this sounds pretty good to me, I do love a bit of a stinker! I do quite like Stinking Bishop, but prefer it when it’s freshly bought….I’ve had it before when it’s been out for a few days and it’s REALLY stinky then!